Traditions more than 1,000 years old still thrive in Ghana. 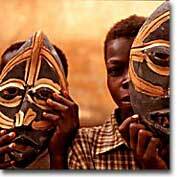 Ghanaian boys are perfectly at home with traditional masks. Certainly they were living the high life ... but how did they do it? Located within the present-day borders of Mauritania, Mali, and Senegal, medieval Ghana literally sat on a gold mine. The land's abundance of resources allowed Ghana's rulers to engage in years of prosperous trading. Strategic governing coupled with great location led to the rapid emergence of a very wealthy empire. Most of what we know about ancient Ghana — which is more accurately called Wagadugu — is based on writings of Arab travelers who came in contact with the nation's peoples. "Ghana" was actually the title given to Wagadugu kings and was used by the Islamic "reporters" to describe the rich and mysterious place they observed. Evidence of Ghana's occupation dates back to the 4th century, but it was several hundred years later that it became established as a nation by a tribe known as the Soninke, whose leaders have been credited with the early strengthening of the Wagadugu state and the expansion of its territories. By 1000 B.C.E., the nation had undergone strategic expansion and taken control of a large pocket of land between the upper Niger and Senegal Rivers. The region was rich in gold, and its acquisition meant that Ghana would become a leading force in the trans-Saharan trade network. The golden stool of the Ashanti kings of Ghana, a symbol of their power, has not been seen by the general public for 300 years. Its location is kept secret, and a replica is used for public display. The leader of all leaders was the king, who was also known as the ghana, or war chief. His word was law. He served as the commander in chief of a highly organized army, the controller of all trade activities, and the head administrator of justice. Mayors, civil servants, counselors, and ministers were appointed by the king to assist with administrative duties — but at all times, the king was in charge. Each day, the king assembled his court and allowed people to publicly voice their complaints. Beating drums that resounded throughout the area signaled the courts assemblage and people gathered to speak their minds. Whether they were neighborly conflicts, or cases of violated rights, the king listened to the complaints and gave his judgment. Such hearings were reportedly peaceful, unless they involved issues of criminal nature. Two of the most serious criminal offenses were the denial of debt and the shedding of blood. 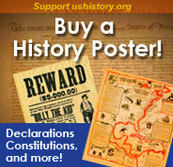 These crimes were tried by ordeal. According to Islamic reports, the criminally accused was given a foul concoction to drink that consisted of sour and bitter-tasting wood and water. If he vomited after tossing back the nasty brew he was declared innocent and was congratulated for passing the test. If he did not vomit, and the beverage remained within, he was considered guilty as charged and suffered the king's wrath. Ghanaian citizens were not the only ones put to the king's test. Inhabitants of its conquered lands were examined for their good behavior and loyalty as well. In territories where order and obedience prevailed, and taxes were properly paid, autonomy was granted. But in areas which struggled for independence or defied the king's laws, Ghanaian governors were appointed as watchdogs and little went unreported to the king. When the king was not busy enforcing his power among the people, he was spreading it internationally through trade. At its peak, Ghana was chiefly bartering gold, ivory, and slaves for salt from Arabs and horses, cloth, swords, and books from North Africans and Europeans. 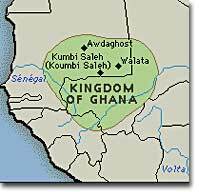 This is a map of the ancient kingdom of Ghana, displaying its location well north of present-day Ghana. Today this area is part of the countries of Mali and Mauritania. As salt was worth its weight in gold, and gold was so abundant in the kingdom, Ghana achieved much of its wealth through trade with the Arabs. Islamic merchants traveled over two months through the desert to reach Ghana and "do business." They were taxed for both what they brought in and what they took out. With this system, it is no wonder that Ghana got rich quickly. The wealth that the kingdom acquired did not, however, serve in its favor forever. Competition from other states in the gold trade eventually took its toll. Jealousy, fear, and anger of Ghana's power prompted its neighbors to stand up against the kingdom. Their efforts were at first weak and insignificant, but eventually, in the mid-11th century, a Muslim group known as the Almoravids launched a devastating invasion on the capital city of Koumbi Saleh. Though territories were seized, and a tribute tax was enforced, Ghana recovered and forced the invaders to withdraw. A little less than 200 years later, however, Ghana was not so lucky. Weakened by subsequent attacks, and cut-off from international trade, the kingdom was vulnerable and unable to prevent defeat. In 1240 C.E., Ghana was absorbed into the growing nation of Mali, which would soon become the next great empire. The single most important development in the history of northwestern Africa was the use of the camel as a transport vehicle. As trade routes were established, ancient Ghana became an important trading center and cultural crossroads between 400 and 1100 C.E., eventually being swallowed and surpassed by the Kingdom of Mali. Ancient Ghana was a society with a complex court system, military organization and gold trade. This site from GhanaWeb provides a full history from ancient days to the present. Its origins are mysterious, and its history has mainly been told through foreigners, but the Kingdom of Ghana was definitely a powerful empire based on abundant gold. This BBC website presents some of the scattered facts, primary source writings, and traditional legends that elucidate this empire that flourished between the Niger and Senegal river.